Yesterday I had the chance to speak on a panel about “The MLA and Its Data: Remix, Reuse, and Research,” which I organized on behalf of the MLA’s Committee on Information Technology. The panel was very successful, due largely to fabulous co-panelists: David Laurence, Ernesto Priego, Chris Zarate, and Lisa Rhody. Ernesto has shared his slides for his presentation on his and Chris’s analysis of tweets from last year’s convention. Unfortunately we missed Jonathan Goodwin, who became ill. Lucky for us, he shared his talk as well. What follows is the text of my talk, “Constellations at the Convention.” The metaphor of the title suggested itself immediately as I began looking at the network within Gephi, but I couldn’t help but think of Matt Kirschenbaum’s post following the 2011 MLA Convention, “The (DH) Stars Come Out in LA.” I think that the methods I’ve been able to begin deploying here might help us track the star system—if not within the profession, but within the convention. I appreciated the interest from the crowd and the thoughtful questions about “algorithmic cruelty” and where such work might lead in the future. If you want to play with the data yourself, you can download the Gephi file of the 2014 and 2015 Mark Sample data. I will see what I can do about sharing the MLA data set. But for the moment, you can explore the four different networks that I showed. I’m currently speaking at the 2015 MLA on the panel “The MLA and Its Data: Remix, Reuse, and Research,” which I organized on behalf of the MLA’s Committee on Information Technology. 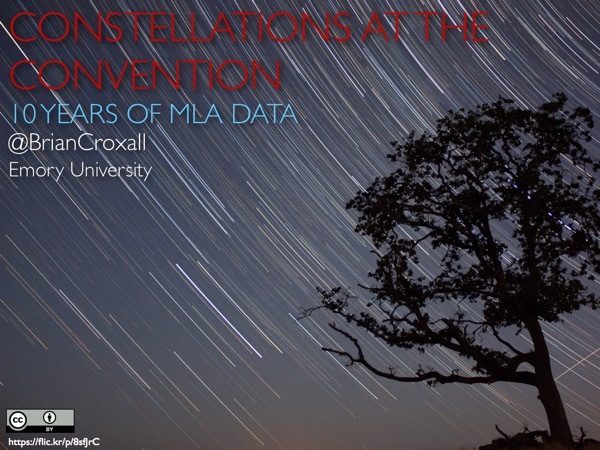 I’ll be posting the full text of my talk—“Constellations at the Convention: 10 Years of MLA Data”—shortly, but here are some links that people might want to play with in the meantime. The latter two might take some time to load. See if you can find yourself in the data!